My main reason for creating a web page is to make available to railway enthusiasts information about the railways of Western Australia (and in particular the rolling stock). I will add to the information available as and when I can. Latest additions are on the "What's New" page. Eventually I intend to have most of my information on West Australian Rolling stock available here including some photographs and drawings. I have started with some of the W.A.G.R. and M.R.W.A. wagons and I will eventually move on to other subjects. Of course I could take the rest of my life doing this and so I have included a page of Railway links to other sites which you can look at until I get finished. I collected much of my data during visits to the old Midland workshops when I was a student with the permission of the then Chief Mechanical Engineer, John Sutton. This is not the only source of information however. The Battye library in Perth has a good collection of material relating to Western Australia including old Government records and a wonderful collection of photographs. The real prize amongst the photos from my point of view is the Passey collection. This consists of over two thousand glass plate negatives from around the turn of the century. The pictures are believed to be from the Rome Studio, 631 Hay Street West, Perth (1900-1910). Earlier pictures in the collection are known to be by S.M. Stout, Nixon & Merrilees and L. Gray-Williams & Co. A list of the photos in the Battye Library collection which I know have something of railway interest in can be downloaded from here in Word 97 format (266k). It is also possible to access information relating to West Australian railway equipment in the UK as a lot of it was constructed there. Sources include Birmingham Library (carriages and wagons) and Glasgow's Mitchell Library (locomotives). WAGR carriages are now covered in book from. Go to A History of WAGR Passenger Carriages if you want to get yourself a copy. 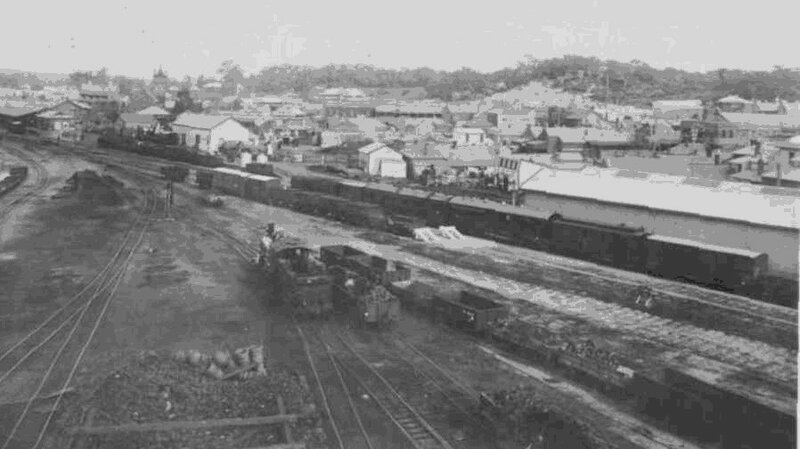 The vast bulk of the railways of Western Australia were built to 3'-6" gauge and remained so until the opening of the Commonwealth Railways line to Kalgoorlie in 1917. There the standard gauge stayed until 1966. My own main interest is in the period from the gold rush until the first world war (which is also the period I model). A brief summary of the early history of the W.A.G.R. can be found on one of the web pages belonging to Roger Palmer. A similar description of the early days of the Great Southern Railway can also be found there. A map showing the development of the WAGR in steam days can be found here. Bunbury in the early years of the 20th century (from a postcard). This page's says that you are visitor number since 9th January 2000.